​The Orchard Valley Quilters Guild holds a quilt show every two years. Our most recent show, Binding Canada Together: One Quilt at a Time, a celebration of Canada's 150th birthday, was held September 23 and 24, 2017. Scroll down for a slide show of this wonderful event. 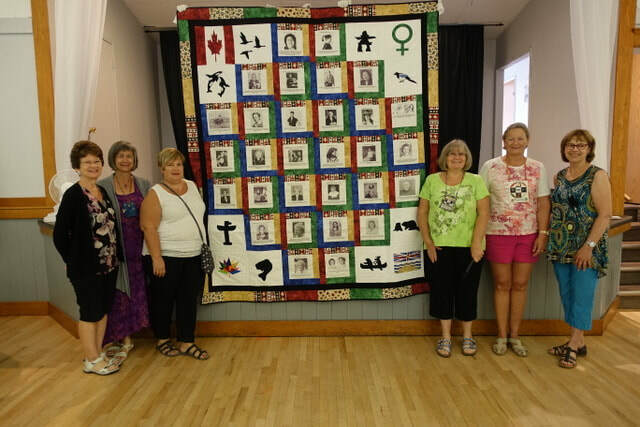 A highlight of the show was the unveiling our special Canada 150 Quilt Project: Women Shaping Our Nation which has been many months in the making. Following the voting at the quilt show, this quilt will be offered to the Women's Studies Department at UBCO where we hope it will find a permanent home. This beautiful quilt, designed and created by members of our guild was featured at our show. The quilt highlights women who have made significant contributions to our nation in various fields. A picture and bio of each woman appears on the quilt -- and in the accompanying booklet below. Read all about it! Congratulations to the winners of our beautiful raffle quilts. Here are Sandy Tombe (L), first prize winner, with the wool quilt made by Joanne Tjaden (L), and second prize winner, Lyn Jeglum (R), receiving her quilt from guild president Shirley Sellers (L).